“What is meant is what is said. The boy will give me a crown. And what is given can be taken away.” Lord Balon tossed the letter onto the brazier, atop the necklace. The parchment curled, blackened, and took flame. As deadly creatures reawaken in the lands north of the Wall, and Robert Baratheon marches north to meet his old friend, Eddard Stark, the Great Houses lay their plans to claim power and influence the Iron Throne for themselves. As the first intrigues are set in motion and the first blades are drawn on the field of battle, where will your allegiances lie? Make your choices clear when you pick up your copy of Taking the Black, the first Chapter Pack for A Game of Thrones: The Card Game, at your local United States retailer or online through our webstore! Every faction receives new cards to swell its forces as the Westeros cycle begins with Taking the Black. 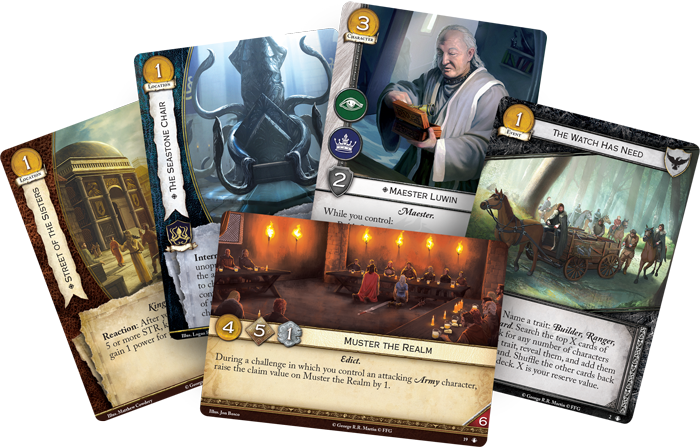 Whether you ride with the knights of the Arbor, trade with merchant princes, or aid the Night’s Watch in its hour of need, you can fully immerse yourself in the world of Westeros with these new cards, including four new plots that offer new deckbuilding opportunities for every schemer and warrior in the realm. As stated above, four new plots are added to the card pool in Taking the Black—two faction-specific and two neutral. One of the faction-specific plots is loyal to House Greyjoy alone: Rise of the Kraken (Taking the Black, 12). 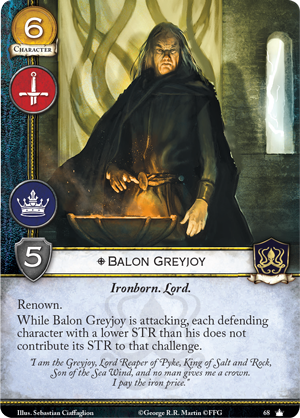 This plot reads, “Interrupt: When you gain power for winning an unopposed challenge, gain 2 power instead.” Obviously, House Greyjoy already specializes in winning unopposed challenges, given their abundance of stealth and powerful characters like Balon Greyjoy (Core Set, 68). Now, Rise of the Kraken gives them the tools to rush to victory faster than before. 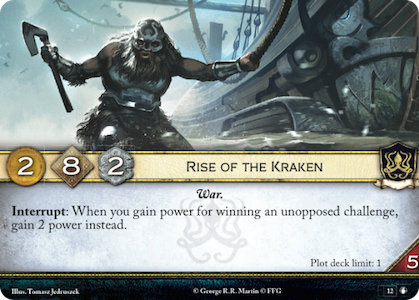 Even aside from its blatantly powerful ability, Rise of the Kraken offers great initiative and a claim value of two, which can be crucial for slaying your opponent’s characters or stealing larger amounts of power. 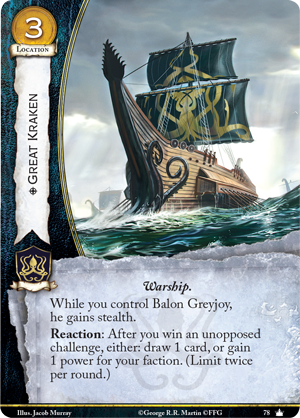 For instance, if you win an unopposed power challenge with Rise of the Kraken revealed, you’ll gain four power from a single challenge—and you’ll gain more if you have cards like Balon Greyjoy or Great Kraken (Core Set, 78) in play. Obviously, Rise of the Kraken is effective in joust games, but it’s at least as dangerous, if not more so, during a melee. A higher number of opponents means a greater chance that there’ll be opportunities somewhere for you to slip past enemy characters and win unopposed challenges. Maybe one opponent is weak to military challenges and another is weak to power. By making your challenges wisely, you could easily win a melee game on the turn you have Rise of the Kraken revealed. If you needed more incentive to seek out and win unopposed challenges as House Greyjoy, this expansion offers up another powerful card in The Seastone Chair (Taking the Black, 11). Whenever claim is applied for one of your unopposed military challenges, you can trigger The Seastone Chair and kneel your faction card to choose a character without attachments controlled by the losing opponent—then, you kill the chosen character instead of your normal claim! Controlling your opponent’s characters though targeted kill and similar effects is often crucial to winning challenges in A Game of Thrones: The Card Game. The Seastone Chair provides a repeatable way to kill some of your opponent’s best characters, and it can open the way for additional unopposed challenges. If you lead with a military challenge that you know will go unopposed, you may trigger The Seastone Chair to kill one of your opponent’s characters with a power icon, which opens the way for you to get an unopposed power challenge. 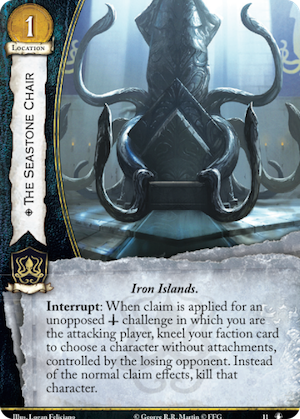 Even if you can’t use The Seastone Chair to force more unopposed challenges through, this location may prove to be a crucial part of House Greyjoy’s decks in the future. 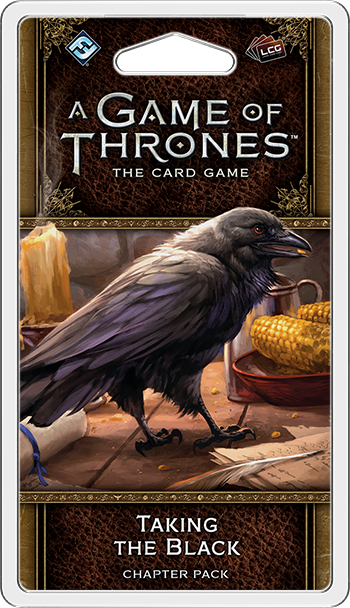 The first Chapter Pack of the Westeros cycle is now available at U.S. retailers! Journey into the world of George R.R. Martin’s A Song of Ice and Fire and pick up your copy of this expansion at your local retailer today.